With the move to our new and improved headquarters this summer, we launched our ‘Life at NEXT’ campaign in order to capture what NEXT Canada’s culture, entrepreneurs and community are all about. A big part of the campaign is our couch session series where NEXT entrepreneurs discuss their startup journeys as well as functional or industry related topics. 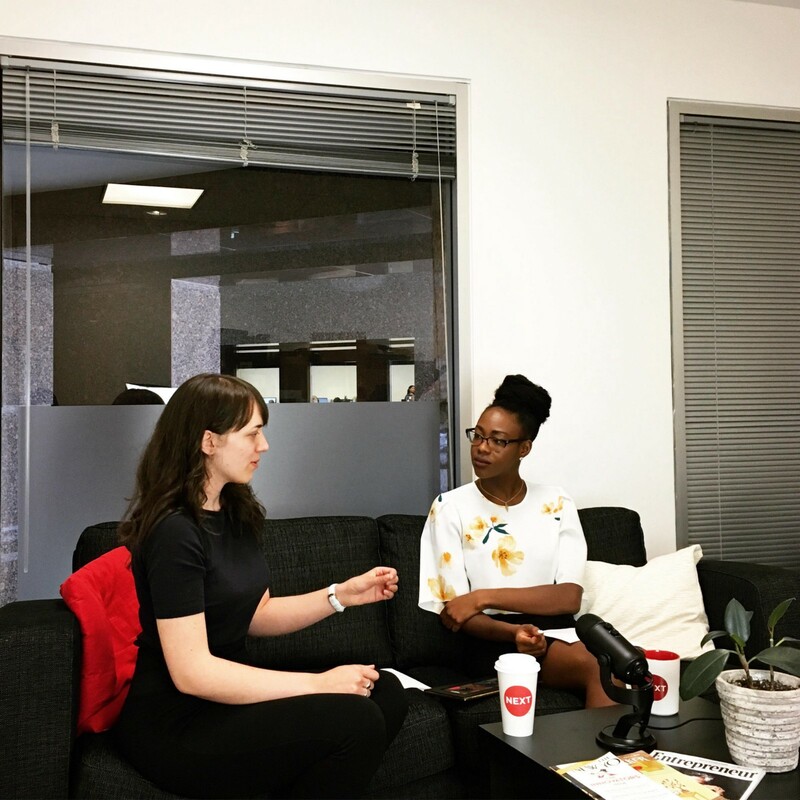 Our first couch session featured Tomi Gbeleyi, Founder of Makeup for Melanin Girls and Sage Franch, Co-founder of Crescendo. The two entrepreneurs who are currently a part of the Next Founders and Next 36 programs respectively chatted about the importance of diversity in the workplace and shared snippets of their entrepreneurship journeys thus far. The overall chat was very inspiring and informative, but we made sure to highlight some important points about inclusivity and diversity, as well as notable tips that any entrepreneur can implement right away. Sage Franch (SF): You should start thinking about it [diversity and inclusion] as soon as you start building a team. Diversity is not something you should wait for because if you are a uniform team of people that look the same and you’re building products that make decisions and have influence on the world, you end up with a culture of ticking the ‘box of diversity’ later down the line. Tomi Gbeleyi (TG): Starting to think about diversity early on means that you are consciously thinking about your culture. Diversity and inclusion go hand in hand with your culture, so to me if you say that’s for later, you are essentially saying your culture conversation is for later. SF: I think every startup team needs to have some form of diversity, otherwise you are within a subset of thought. You’re not able to empathize with all of your customers, you are not able to build things for everyone. Ultimately, you are building a business where you want to reach a larger audience, so it should always come back to that. It should be from day one that you are thinking about diversity and if you don’t have a team that is inherently diverse, hire it. SF: It all comes back to this: how much do you value reaching a larger audience? How much do you value technology that is fair to the people you are trying to sell it to? If you play catch up later on with diversity, your technology is going to do the same thing. TG: A big part that companies often forget is retention. So you have gone out, made this mandate that says ‘we’re going to hire x amount of diverse people’, but we have seen that this quota-based hiring is not effective. This is often because you are missing the other piece: how do you keep people there? Diversity and inclusion is a long term commitment and it’s not just making a quota-based mandate that gets a visible minority through the door. SF: We (at Crescendo) found a stat: 37% of people who leave tech jobs leave because of bias (Kapor Tech Leavers Study, 2017). That points to a deeper issue and shows that some companies are not doing retention right. TG: There are some great books that are out there that founders can read including Patty McCord’s Powerful: Building a Culture of Freedom and Responsibility. TG: Diversity panels at events are fine, but what happens after that? They should be followed up with some technical tools to attract, hire and retain the diverse audience that attends those events in order to make a greater impact. SF: What I find to be more successful [than diversity panel events] are roundtable events where companies are starting to host these open events for discussion. They are inviting people from all over to come out and have small, intimate discussions about what diversity and inclusion looks like to them. It’s a lot less ‘let me preach to you’ and a lot more ‘what have you gone through, let’s build empathy for one another’. And that’s where the real learning and understanding happens. SF: Within the workplace, honest feedback is a very strong tool that allows you to identify your own unconscious biases. Having an open culture and trusting one another to give and receive honest feedback is a great tool to avoid bias. SF: If we successfully start implementing tools that make the workplace and world more inclusive we will start to see a lot more diversity throughout all of the levels within an organizational structure. So if we start to do retention better we will start to see more visible minorities and women up in the higher ranks and on executive panels. That will be really key as well as we move into an AI based future. TG: I am hoping that before we get to the workplace (especially with STEM) we are encouraging more women to not just be in those fields, but also address the biases that happen before they even get into the workplace. What are 1–2 things every entrepreneur should do to be successful? TG: Entrepreneurship is not easy. Sometimes it comes with a lot of anxiety, there’s a lot going on. You might see other entrepreneurs being celebrities while you’re grinding away. So you have to learn to take care of yourself. Even if that is not the case, and things are going great and everyone wants you to come to this panel or that, you kind of have to remember that your overall wellbeing is important. Some things that I do are as simple as blocking off the times between 7am-11am just to give myself some time to reflect on what’s going on with my business in that day. On the days that I need a break I do quite a bit of yoga. SF: I do a lot of yoga too, but I’m trying to get better at the sleeping part of self care. I always thought I could survive on a bit of sleep and thought it was a successful thing. But now I have realized that it’s actually not something to be proud of. Sleepless nights aren’t something that you should strive towards. TG: Listening is the second thing that entrepreneurs should add to their checklist. It is something that I struggle with because I get very passionate and excited. It is especially important to listen when you have other people working for your company or when dealing with customers and even advisors. It is the only way you are going to move ahead. SF: Listening is the only way you are going to take in feedback. As an entrepreneur one of the first pieces of advice that I got was that I’m going to get a lot of advice and it’s up to me to determine what is good or bad advice. At first I thought that it wouldn’t be such a big problem, but it is so true. In one day I will get 4 pieces of really strong opinions and they are all different. And so I think okay I have to listen and weigh and determine all of these smart people’s opinions on what I should do next. I need to figure out what works for me, but also listen respectfully and continue to value their advice regardless of whether it is what I end up doing. Listening is so much more than taking it in and executing. It is a whole whirlwind of things that you need to consider. Hear more about #LifeatNEXT by tuning in to our next Couch Session, Innovating for Sustainability, on July 6th at 2:30PM (EST) via Facebook Live. Thank you to our creative partner Nuscreen for powering our couch sessions!